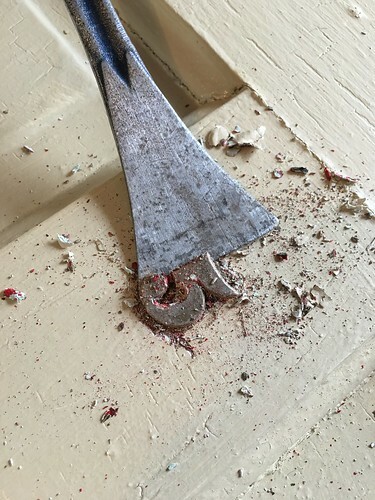 We need your help identifying where we can find some antique architectural details! That's right, I've searched high and low for these buggers and can't come up with a viable source thus far. "What am I looking for?" You might ask. Antique brass nail backed numbers for hotel room doors, of course! Let me fill you in. 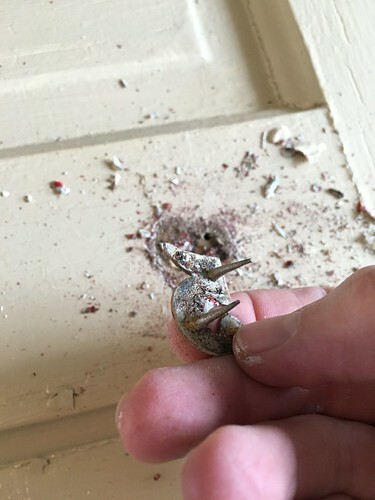 One of the most important aspects in the restoration of an old home is the unending search for *just* the right components. You know the saying "God is in the detail" or "anything worth doing is worth doing right"? Well, I live by these sayings...often to a fault! ...the search is as much of a part of DIY renovation as is the installation of the components. 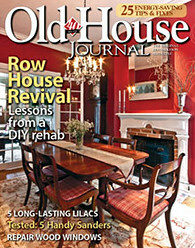 We've spent so many years ensuring many aspects of our home in Old Town Alexandria are historically appropriate, the items work with our home's aesthetics, and they add a certain level of ambiance to our home, that the end result gives me so much pride of accomplishment it almost makes me forget the long hunt. Wait, who am I kidding? I also love the hunt. When we bought our second home, one of the primary details that drew us to the house was its history. Built in 1908, and retaining many period original details like molding, floors, plaster walls, and doors, the home's interior and exterior begins to tell its story. 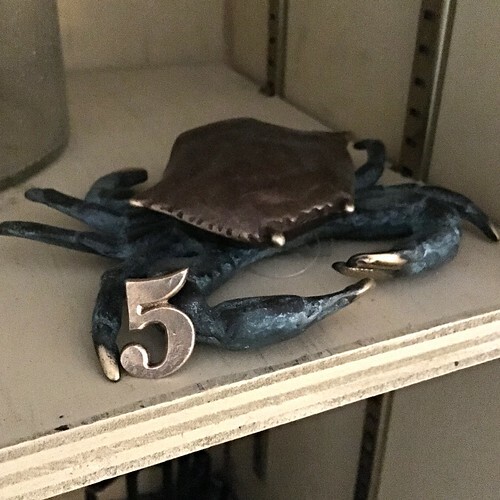 But the biggest and most important part of our home's history can really only be seen in three small and easily overlooked decorative elements spread throughout the house. You see, our house was originally built as a hotel. Obviously a "hotel" by today's standards is very different, but back in its day our house, with its picturesque water views, was a roughly seven room hotel used as a summer getaway and overnight spot for ferry passengers landing nearby. 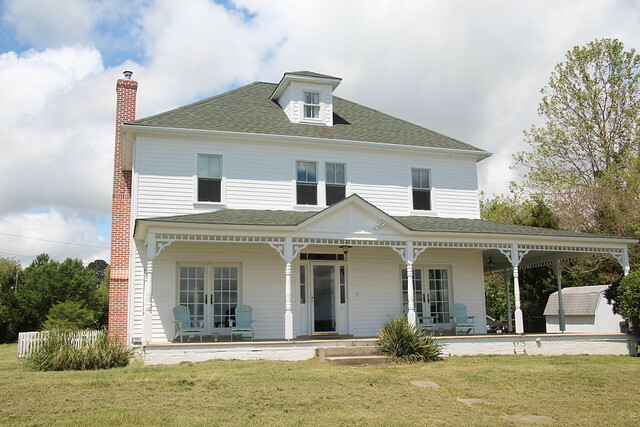 The hotel's original owners lived in the back portion of the house, and they were the proprietors of the hotel, which is one of the few and earliest known African American owned and operated businesses in the county. From the research we've done, it looks like our home actually ran as a hotel as late as the 1960s, and it appears to have stayed in that original family until the 1970s. After pretty extensive alterations in the early 1990s to make this a single family home rather than a small hotel, evidence of its life as a hotel doesn't exist in many places in the house. But a few original doors in our home are still adorned with little brass room numbers, caked under many layers of paint. Some of the other original doors clearly have holes or outlines in paint where numbers used to be. 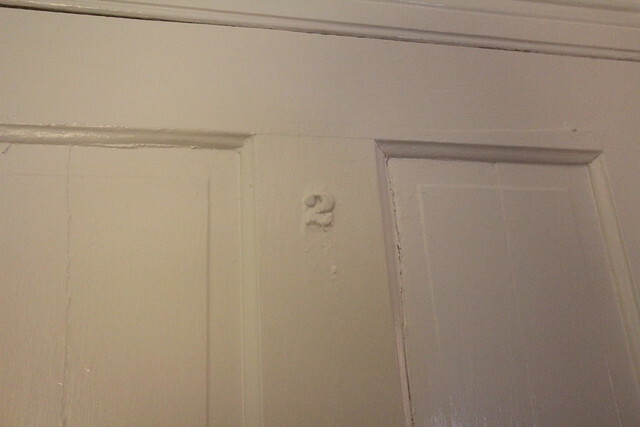 After looking through the whole house, three doors have retained their original room numbers. We have a #1, #2, and #5. 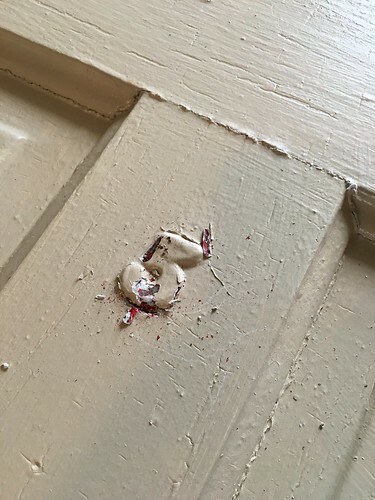 The #5 was on the downstairs bathroom door that we recently painted, which indicates that door may have been moved at some point, so I decided to remove the number in order to clean it up a bit and learn a little more. I carefully scored the paint around the number in order free the edges without scratching it. I wasn't sure what material the numbers were, so I didn't want to do anything that could damage the detail. I also chipped off a little of the surface paint with the five-in-one tool to reveal the aged metal. After sufficiently freeing the number's edge I could see some gold peeking out from under the many layers of paint, including a very bright red that once covered the entire door. I worked the pry bar under the edge of the number and was able to slowly and carefully convince it to come free. I wasn't sure if there were a few nails holding each number on the door or how it was affixed. Once I removed the number I could see that the number had two tacks integrated right in with the number. 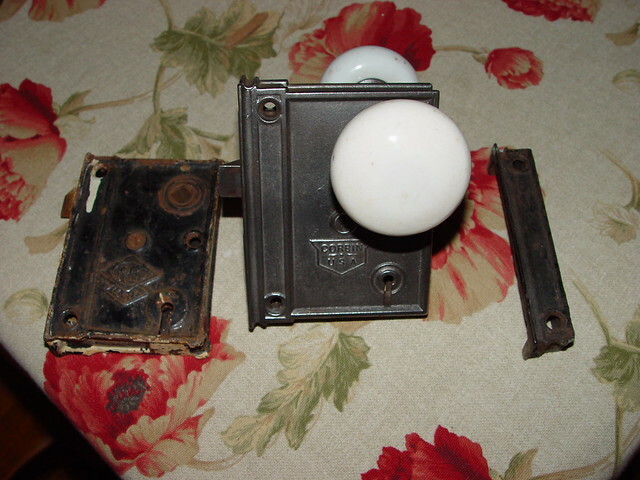 These two tacks were then driven into the door where it could securely tell the visitor which room was theirs. Once I saw that the numbers were brass and covered with many layers of paint, I knew I'd be able to clean them up on the wire wheel without any issue. A few minutes later we had ourselves a paint free and shiny #5. The face may have been polished brass at some point, but I could see just how scuffed it was under the paint, so I felt okay making it a satin brass style finish. Now that I've removed the paint from our #5, I'll be doing the same for #1 and #2. But at this point, I don't feel like we have enough numbers in our collection. 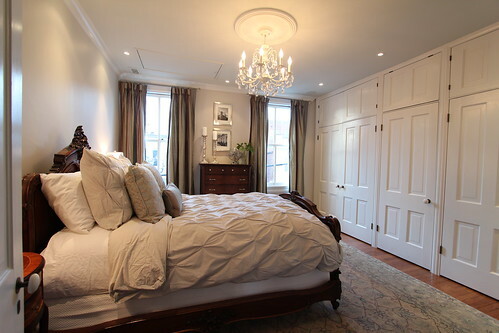 We'd love to restore a few aspects of our home that give a nod to its original role as a hotel, and it seems adding room numbers to the sleeping room doors would be the perfect way to do just this. But no matter what I search for, I can't seem to find an identical match to these numbers. They're just about one inch tall, each has two tacks sticking out of the back, and are solid brass. If you know where we might be able to find a collection of a few of these little pieces, we'd love to hear. We're looking for a few numbers to fill in, probably just a #3 and #4, but if we were to find a few additional numbers, we'd certainly pick them up. So if you've seen any of these floating around in antique stores, salvage yards, or on websites, we'd love to hear where. And until we can find the few we're looking for, the hunt will carry on. I'll tell you one thing for sure, I certainly won't stop searching until we find what we're looking for. There's a pretty amazing reclamation place near me called Lassco that you guys would absolutely love, I wish I could take you! I'm going again soon so I'll certainly take a look with a tiny chance that typeface made it over here... Good luck in the meantime! You two are both so incredibly inspirational. Your blog is one of the reasons that I started my own! But beyond that, you've converted me into loving old homes the idea of restoring them! I absolutely love how informative your posts are, I've learned a ton from reading about your home projects and actually have referenced back to your posts multiple times to explain certain design ideas I get to my husband. We recently (I mean, we take possession in two weeks! 25-year-old first time home owners here!) bought a house in Ontario, Canada that was built in 1890 and while it needs a ton of work I am so excited to slowly make it our own. What's more, we've already met the neighbours and they're old house lovers too and said that they would gladly show us how to restore the original windows to make them work properly again. These numbers have to be out there somewhere. Many building materials catalogs from the 1900s through the 1920s have similar numbers, so they were made and sold for quite a while. We were looking for some that were larger to use as house numbers and ended up having to settle for some aluminum numbers that were made in the '40s. Not ideal, but better than nothing I guess. If we see any in our travels, we'll let you know. I don't know if there are any of these in your area, but the place to look for something like this is in construction donation stores. We have one here in Pittsburgh called Construction Junction and you can find all sorts of cool things there. I'd give them a call to see what they have and search around your area for these same sort of stores. Check out this web page: http://m.joeley.net and plan a trip to Louisville! Amazing place. You can spend days in there and never see everything. I have seen things like door hardware and numbers there. They have everything. If they don't have it, I bet they can get it for you. Have you tried contacting bed and breakfasts that are for sale? Or you can call your local historic society or habitat for humanity restore to see if they know of any places. I'm sure you've already tried Luckett's but maybe Brimfield will have what you need, I can guarantee they will have a ton of stuff you never knew you needed. I'd put the numbers you have in a shadow box and hang it somewhere and then look around for an intact antique collection to put on the doors. Trying to match those sounds like an exercise in futility and frustration. I'll gladly eat my words in 6-9 years when you do manage to track them all down! What a cool history your home has! You can always tell your guests that the rooms available are "one, two, five-" "No! Three, sir!" Can't help but feel finding exact originals to match is a long shot but you could commission a local blacksmith to create sympathetic reproductions. The font looks like its based on a stencil typeface. I found a very similar version here which you could use to figure out how the other numbers in the set would likely have looked. Great article, I love to read this kinda sentimental stories. Searching for that kind details like room numbers with same fonts and size, it is like treasure hunt. Good luck! Liz's Antique Hardware in LA - they have all kinds of this sort of thing and are the nicest people. I'm sure you could send them a picture and they could tell you whether they have matching numbers. I installed a salvaged Victorian door in my home with a similar number on it. Apparently the door came from a house that had been used as an apartment house or boarding house or something. 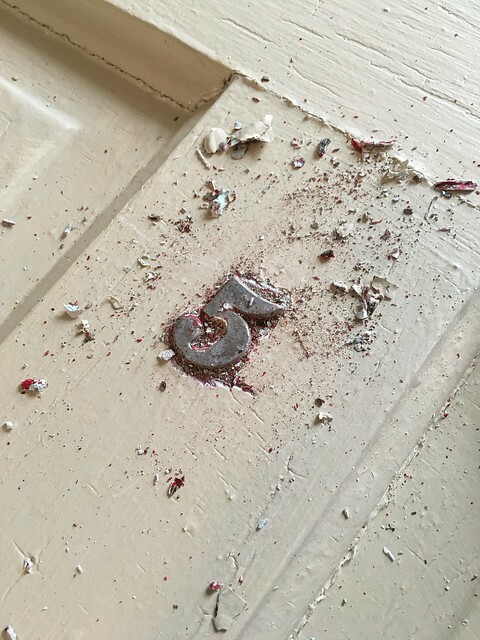 This door had been door number 5. 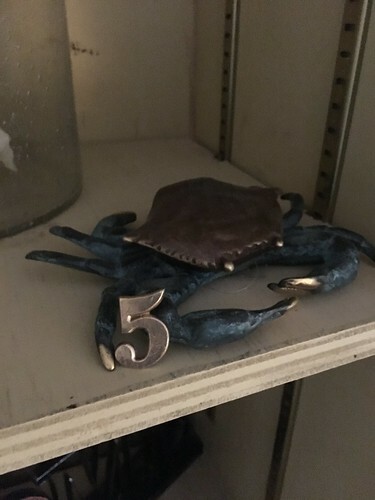 I was initially going to remove the number, but when I started stripping the door I discovered the number was brass and quite nice, so I kept it. 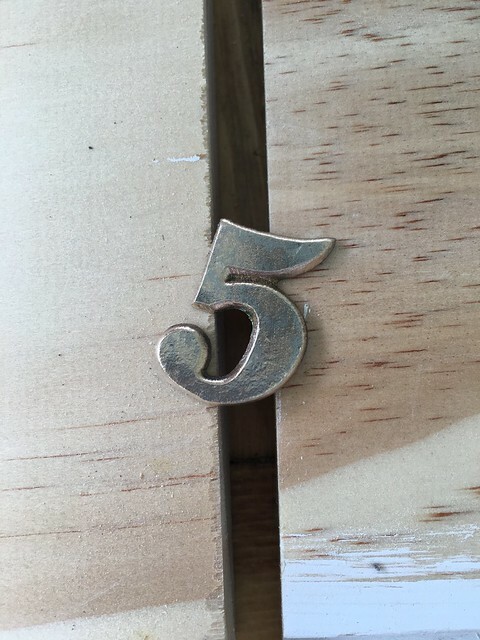 Now people wonder what the deal is with door 5. It adds a little mystery to the house. If your ever in Richmond, VA please check out these two places. They have an extensive collection of things like this. Good luck. I needed an authentic lock for new bathroom addition. Ended up making a trip to "The Brass Knob Architectural Antiques" in DC, assuming I remember the name of the place correctly. They sell bunch of reclaimed hardware. Picked up a rim lock, cleaned it up, painted and it's been working great. That place is a bit on expensive side but it was worth the effort to me. I was wondering if you could have someone cast them since you just need the two? I wonder if you could make them with a 3D printer?